What surprises me about the exposition of the Parable of Talents by the preachers is their emphasis on the attitude of the man who received one talent. The Pentecostals even threaten their congregations with the plight of that man post judgement. Instead of expounding on the Patience, Effort and Hope exercised by the five talent man to double the talents he received, they talk of the judgemental, slothful and diffidence of the one talent man! Incentivisation needs to replace threats in Christian preaching. Fear CANNOT form the basis of any choice, at best it could only make a human freeze into inactivity. 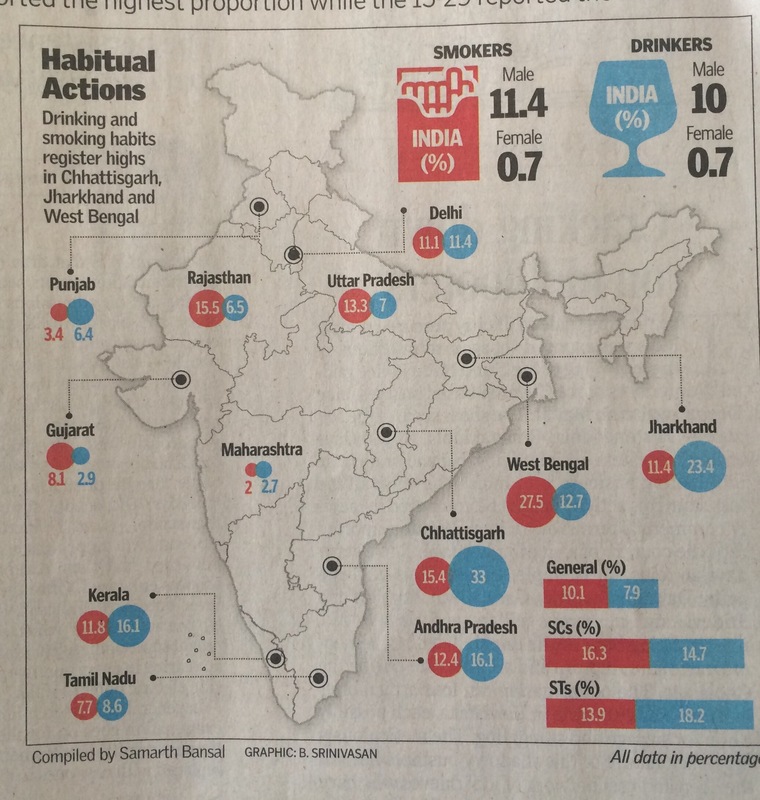 Smoking & Drinking demographics in India! Smoking & Drinking data! Sample Registration System (SRS), Baseline Survey released by the Registrar General of India shows that Tamil Nadu has a 7.7% smoking population and 8.6% drinking population compared to 12.4% & 16.1% (AP); & 11.8% & 16.1% (KL). The national average for the corresponding habits are 12.1% and 10.7%. The following is a thumbnail of geographical representation by these two groups, as per the survey. There has been a talk that the incumbent government of Tamil Nadu had converted around 10% of the Tamils into drunkards. The fellows who bandied these half baked theories based on concocted or imagined data had attempted to prejudice the voters by insinuating that 10% of the Tamil populace had been made drunkards. What a big lie! Thank God, for his great mercies for having given the TN voters a discerning mind. The next question is: if a 8.6% population of TN could generate INR 30,000 crores annually, what ought to be the revenue generation of the state of UP , which has three times the population with a 7% drinking population ? So where does that ‘revenue’ go? Is it because of poor harnessing of the governmental functions or a planned skimming of governmental revenues? Time to think. The revenues from smoking is appropriated by the Union Government and the revenues from intoxicants belong to the States by virtue of entry no 8 of List 2 of the Seventh Schedule. The point is, a state’s revenue is bolstered mainly through taxes on alcohol, sales tax and land revenues. When a major state like UP bungles in generation and collection of taxes from sale, production and distribution of alcohol, it not only impoverishes itself, but becomes a pretext for the Union government for collecting and apportioning higher grants and share of the central revenues for its ‘upliftment’, which has been happening for more than 6 decades. This has an impact on the more efficient states, as it is their legitimate share from the centre’s revenues which get diverted on these repeated and unrepaired socialistic grounds. It is time for the ‘efficient’ states to form a think tank to help these ‘inefficient’ states to help generate and maximise their state revenues, otherwise the revenues from the Union are likely to be spent on some of the black hole states which have no transparency or fiscal discipline and become a bigger burden to the economy. There lurks one SINGLE QUESTION in every mind, which lies hidden unanswered waiting to surface and show itself up. But the ignorance of the answer to that question causes the mind NEVER EVER to FRAME that question. But the underlying question keeps effervescing. That ANXIETY causes ACTIVITY, which can be answered, through meditation/prayer ONLY. Any amount of activity is not going to find the answer to that question. If Solomon failed, I am sure that I wouldn’t be able to find the answer. One day You through meditation or prayer would find that ANSWER first, and the QUESTION POPS OUT! QED. All good questions don’t beg for answers, but seek PROOF TO YOUR ANSWERS. Religious rivets!As rusted rivets of religious taboos fall apart, laminates of decorum flake up, revealing the enticing opportunities of Life! Beware! If the priest doesn’t come with new rivets, your enfeebled conscience, in time, will concoct ritual rivets.